Last year, I heard through the grapevine that the C.B. 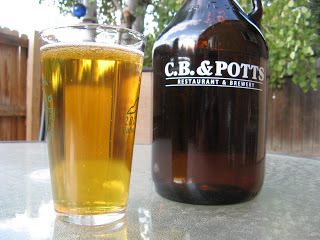 & Potts brewery at Flatirons, in Broomfield, Colorado, was experimenting with a gluten-free beer. Alas, when I contacted head brewmaster Dennis O’Harrow, I found that the brewery was fresh out of the new brew. Thankfully, the GF beer – Don’t Be A Gluten – is back on tap this summer, with many improvements, according to O’Harrow. O’Harrow was a passionate homebrewer for 12 years, and worked for the Safeway brand of supermarkets. One day, he turned to his wife and expressed a desire to make his passion his work. He accrued two years worth of vacation and then jetted off to the University of Sunderland’s Brewlab, in the United Kingdom, to learn how to become a brewer. Upon returning to his native Colorado, he apprenticed before landing a position as the head brewmaster for the C.B. & Potts in Broomfield, and he’s been there ever since. C.B. & Potts has six locations in Colorado and one in Wyoming, and is part of the Ram International family of restaurants and breweries. About two years ago, O’Harrow read a newspaper article about Celiac Disease, and was astonished by its prevalence. That motivated him to craft a GF beer for people like me (and presumably, you the reader!). Don’t Be A Gluten is nothing short of an exceptional GF beer. It’s light and refreshing, and the flavor profile is superb. This beer can stand up against the best GF beers in the world. It scores major points with me on a few additional counts: 1) It’s on tap! Literally every other gluten-free beer I’ve ever had has come out of a bottle. It’s wonderful to have a pint glass of beer pulled off a tap. 2) It’s a pale ale! Most GF beers are either ambers or lagers. It’s wonderfully refreshing to have a lighter choice in the pale ale category. My final analysis: I’d be genuinely shocked if it doesn’t medal at GABF. The only downsides to the beer are that it’s only available locally (beyond Colorado’s Front Range you’d have a hard time getting your hands on some) and that it’s currently a seasonal (meaning you can’t enjoy it year-round). Notwithstanding those minor points, Don’t Be A Gluten is a home run.